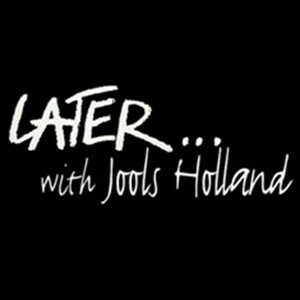 Later... with Jools Holland is a contemporary British music television show hosted by Jools Holland. It has been running in short series since 1992 and is a part of BBC Two's late-night line-up, usually at around 11pm to 12 midnight. The day of transmission has varied, but currently it is usually recorded on a Tuesday for Friday broadcast and features a mixture of both established and new musical artists, from solo performers to bands and larger ensembles. The show is considered an institution, having notched up millions of fans around the world. It is currently broadcast in America on Ovation; previously it has been shown on BBC America, Fuse, and Rave HD. The Ovation and Fuse broadcasts leave out several performances (and usually one or two performers entirely) in order to air commercials within a one-hour timeslot. It is also shown in Australia on the UKTV channel and ABC2, in Canada on HIFI and AUX TV, in Germany on zdf.kultur and in Portugal, Switzerland, Belgium, France and the United Arab Emirates on iConcerts HD. On 10 December, 1992, Morrissey and his band appeared on Later...With Jools Holland and performed Certain People I Know and Suedehead. On 12 November, 1995, Morrissey and his band again appeared on Later...With Jools Holland and performed The Boy Racer and Sunny. This appearance also included a brief interview. On 21 May, 2004, after a nearly nine year absence, Morrissey and his band appeared on Later...With Jools Holland. Four songs were performed this appearance, including Irish Blood, English Heart, First Of The Gang To Die, Let Me Kiss You and There Is A Light That Never Goes Out. As in 1995, this appearance included a brief interview. On 2 June, 2006, Morrissey appeared on Later...With Jools Holland. Three songs were performed this appearance, including You Have Killed Me, The Youngest Was The Most Loved and I Just Want To See The Boy Happy. On 8 February, 2008, Morrissey and his band appeared on Later...With Jools Holland. The four songs performed this evening were That's How People Grow Up, Something Is Squeezing My Skull, All You Need Is Me and The Last Of The Famous International Playboys. ↑ Later... with Jools Holland Wikipedia page. Wikipedia. Retrieved from Wikipedia.org. This page was last modified on 31 October 2012, at 10:20.